Mrs. D. M. was a woman of fifty-five. She was nearly three stone overweight. Her diet consisted largely of fat meats and starchy vegetables. She liked to indulge her appetite in creamy chocolates and rich desserts. Her life was spent indoors, and even holidays found Mrs. M. beneath a parasol, behind a newspaper, covered by long, neck-tight dresses and billowy hats. She died following a siege of pain and disease. What killed Mrs. D. M.? Which sunless day? Which foul-aired room? Which pound of chocolates? Your human body is a marvel of construction. It is strong, resilient, and capable of withstanding amazing amounts of abuse— but not endless abuse. Disease, decay and early death are not the products of any single excess or failure. Rather, they are the end result of living contrary to the laws of life day after day. The disease of the forties or fifties results from the mistakes of the twenties and thirties. How must you begin your new life? What laws of nature must you start to observe with the first day of your rebirth? The first day of your new life must begin with an onslaught against the enemies of your body and brain. For your body and mind are as much a part of one another as are tree and leaves. They cannot be maintained in separate conditions of health. Therefore, the first day of your new life must begin with two primary conditions for longevity, painless existence and happy living. You must believe in and be determined to achieve this condition of permanent good health by defeating the negative attitudes that have long been a part of your former life. Even as you cleanse your mind of the negative thinking that would have removed happiness, health and years of existence from your life, you must cleanse your body of the toxins that you have been storing through the years. These are the poisons of decay, malnutrition, foul air, indoor life, to mention a few. The basic prescription for natural living is a simple one. It consists of three functions which, once begun, must continue throughout the course of your new life if you are to live as nature intended. CLEANSE BODY AND MIND: To combat the decay that unnatural existence, has already brought to your body and mind, you must begin by cleansing yourself of the poisons of that life. By employing all the natural means of eliminating these toxins, a fresh and revitalized approach to life can be yours. REPAIR THE DAMAGE: The toxins of unnatural life have wrought damage upon your body through the years. However, cleansing your body is not enough, if the organs have already been damaged through dangerous, unnatural excesses and the absence of contact with nature. Then you must proceed to rebuild the ravaged organs and tissues of your body with careful application of nature’s agents. MAINTAIN YOUR NATURAL HEALTH: Once cleansed of toxins and with the ravages of unnatural existence repaired, you now can proceed to live in harmony with nature, thus ensuring the maintenance of your health and happiness. In outline form, these three laws of life seem simple enough. But before you can even attempt to enforce this new discipline upon your body, you must be sure that you understand all that is involved. There are four major exits for the waste matter accumulated by your body. Most people are not aware of this. 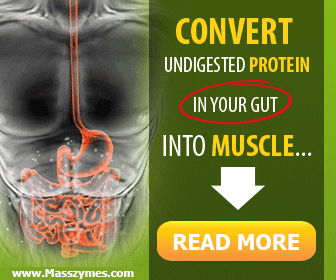 Certainly all of us are aware of the pain and discomfort of constipation. The bowel movement is a fundamental means of elimination, and the corruption of this natural action spells more than discomfort for the sufferer. Urination is, of course, the second most important eliminatory action. There are two other means of elimination which are important to the cleansing of our bodies and which are too often overlooked by most of us. They are the exits of skin and lung — perspiration and breathing. Oxygen is a “nutrient,” that is, a food. Your blood feeds upon oxygen. Each organ, each cell of your body is revitalized by the blood stream. Blood that is improperly fed cannot repair the damaged tissues of your body. If the air you breathe is clean, fresh, life-sustaining, then the blood will be properly fed. 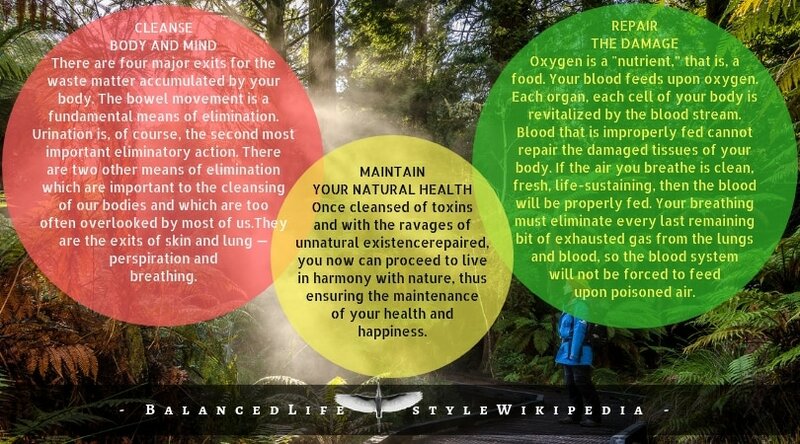 Your breathing must eliminate every last remaining bit of exhausted gas from the lungs and blood, so the blood system will not be forced to feed upon poisoned air. I cannot stress too strongly that you must breathe deeply, so that exhalable gases will not be delayed in the lungs, and so that your blood will be fully saturated with oxygen. 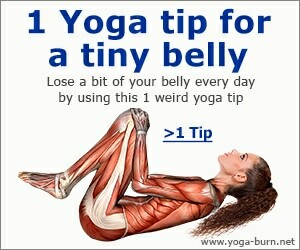 Breathe deep down to your abdomen, not high in your chest. You should remember that oxygen is an important nutrient and a substance that, by a process of oxidation, helps the organism not only to produce heat but also to get rid of the harmful, poisonous waste products of your metabolism. The skin is possibly the most abused organ of elimination. Your body is covered with thousands of small openings called pores. Cleansed properly and permitted free access to sun, light and air, pores assist us in discarding waste matter from the system through perspiration and evaporation. Denied air, sun and water, the decay of that waste will remain within your body in part and upon the surface of your skin as putrefied matter. We might do well, while we are cleansing things, to start with our own kitchens. I cannot think of a better first step on the road to your new life than the one that leads us to your kitchen, where we can proceed to cleanse the cupboards of dead food. Yes, dead food. Food that is devoid of life or life- giving elements. White sugar, white flour and processed cheese are three major offenders. Sugar, natural or raw sugar, that is, is a good food. Sucked directly from the cane, it is a delightful food and you are missing something if you have never tasted sugar-cane. The raw sugar extracted from the cane is a brown, pebbly substance that contains many natural minerals of value to the body. White sugar, granulated, powdered or even the refined brown sugar, which is not to be confused with the raw product, has no value to the human body other than the calories with which it supplies us. Since all foods that are high in calorie content and low in other nutrients, minerals and vitamins, are almost useless to us, it would be best to eliminate processed sugar from the diet altogether. If your diet demands sweetening, and most of us have an active sweet tooth, then try raw sugar. Honey and molasses are also fine substitutes for refined sugar. White flour is an even greater offender. Wheat has often been called the staff of life, with its abundant supply of so many of the life-giving elements: vitamins and minerals. But white flour is an impostor. The heart of the wheat has been removed. The flour is processed and reprocessed to give it that snowy appearance that seems to spell goodness, and actually means uselessness. Here is another high-calorie food that will sap energy from the body during digestion and add little more than fat to the system. Dump that canister of white flour now! Drop it in the dustbin where it belongs. Fill the canister instead with good, whole-grain flour, which can be obtained at most grocers and any good health-food stores. The whole-grain flour will provide you with energy, vitamins, particularly the B-Complex, so important to health, and many of the required minerals. Processed cheese cannot be called useless. It has a’ use. It is a fine means of encouraging constipation, if that is considered a use. Beyond that, the processes involved in making these spreads and bulk cheese seem to be organized to deliver the least benefit in the greatest bulk. If you need any further warning before you strip your kitchen of these three food frauds, then let me supply it at once. White sugar causes tooth decay. It cuts the appetite to the point where more valuable foods are eliminated from your menu, thus robbing you of your natural heritage of a good balanced diet. White flour and white bread fill you with the least useful portion of the wheat, since the germ of the wheat is removed in the production of such flour. In addition, baked goods made of white flour are filled with various chemicals to whiten and preserve them. None of these are guaranteed to preserve you, however. One such chemical, bromine, has in fact proved to induce insanity in dogs. Certainly bromine will not help the mentality of the average human being one bit. Fortunately, flour millers have been forced by law to discontinue the use of bromine in their processing of flour. The other artificial bleaches and preservatives remain. Avoid them at the penalty of decay and possible insanity or death! The elimination of these three, white flour, refined sugar and processed cheese, is the beginning of the cleansing process that must be begun on the first day -of your new life. Before we have finished with your kitchen, there is much more to be done. It has often been said that many men dig their graves with a spoon. Learn to choose your foods correctly, with an eye to health, not creamy, richly decorated beauty. The rich desserts and sweets that too many of us befoul our stomachs with can best be called “beautiful poisons”. It is a fitting phrase. Learn your food requirements and know the value of every food you eat. You would not put sand in the petrol tank of your car. Then why do the same to your body? In ‘A Complete Guide To Healthy Eating!’, I have detailed the exact values involved in each and every food we consume. In the final pages of this book, devoted to diet, I have detailed a splendid diet for eliminatory purposes. I call it the “Return-to-Nature Diet”. Begin your life with an internal bath and you will soon know what true health can be. You cannot hope to overcome the destruction of years of living out of harmony with nature in any short period of time. You are fortunate in that the equipment of your birth is able to absorb so many shocks, distortions and attacks without collapsing completely under the strain. You cannot expect to repair years of constant abrasion, corrosion and abuse in a matter of days. The course needed for the repair of your body depends largely upon its condition. There are no two fingerprints alike, and there are no two bodies quite alike. The application of natural methods will depend upon the general health of your body. You may be able to benefit most by one degree of exercise and exertion, others by another. You may respond best to water bathing, others more readily to air and sun. Grow to understand your body and its characteristics. Know the skin of your entire body as well as you know that of your face. Be conscious of such things as bowel movement, liquid intake, normal temperature and pulse, sleeping habits, etc. These, even pulse and temperature, vary with the individual. Therefore, become acquainted with your individual body functions and routine. For only by knowing the normal routine of your system can you recognize those deviations from the norm that indicate malfunctions of your body. These changes may not be dangerous in themselves, but they can prepare you for what lies ahead. For they are nature’s warnings! The maintenance of good health is indeed the simplest of all the tasks that lie ahead of you. Once your body has been cleansed of waste matter and its resultant poisons and the decay of those toxins has been repaired, maintaining good health becomes a simple matter of living the sensible, balanced, natural existence we were all meant to conduct. Natural living, the prevention of disease and decay, is pleasant, uncomplicated and filled with the zest of joyful experience. One month of living in harmony with nature will make pale beside it all those years of complication, frustration and the kind of competitive existence that turns life into a short, worried path from cradle to grave. Natural living is no great secret that lies hidden within the maze of laboratory equipment and scientific formula, although it is a secret to most of us today. To live in harmony with nature is to observe the laws which early man knew as the only way of life. To sleep well. To eat intelligently. To expose body and soul to the warm, deep and satisfying therapy of sun, water and air. Why do you suppose it is that these three fundamentals of health, Clean, Repair, Maintain, have so long been ignored? Why is it that even to this day, so many turn to the test-tube and the knife for a quick road to health, though often neither of these proves more than immediate means of relief? Why do you suppose it is that even at this late date in history, our men of science continue to be baffled by such seemingly simple conditions as the common cold, fatigue, headaches and rheumatic pains? For the answer to this we will turn in the next article Four Ways To Contact Nature to the healing qualities of earth, sun, air and water, which stand in marked contrast to the basis of modern medicine, that sacred cow, the germ theory of disease. This, then, is my recommendation for the first day of your new life. Keep on reading on Balanced Lifestyle Wikipedia to learn the ways dealing with internal and external cleanliness. Study the eliminatory diet. Then prepare for tomorrow. Starting with your first waking moment, begin to live your new life. Prepare for health, happiness and long years of rewarding existence. It can be yours! I’ve learn some good stuff here. Certainly value bookmarking for revisiting. I surprise how much effort you set to create this sort of excellent informative web site. Amazing article. You just don’t update my know-how but also change the way I think about living a healthy life. Thanks for the great information. Worth to bookmark. Every time I came across your blog you make to pause for some new articles and excellent information regarding health. Thanks and keep the great work going on!